These days, e-mail is so essential to the way we work that even the slightest hiccup in the flow of messages can ruin your day. You don’t have to put up with a cluttered, creaking inbox or attachments you just can’t seem to send. Here’s how to deal with common pet peeves. When I’m on the road, I can’t send e-mail messages through my regular Internet service provider. Is there a service I can use that will let me send e-mail from the road? To fight spammers, many ISPs prevent you from sending mail through their outgoing mail server if your computer isn’t connected to their network. One way to get around this is to pay an e-mail relay service—such as SMTP.com, DynDNS.com, or DNSExit.com—for the use of its outbound mail server when you’re traveling. You can use any e-mail program or device, and mail appears to come from your usual e-mail account. Relay services also allow you to get around networks that block traffic on port 25 (the normal outgoing mail port), by supplying an alternative outgoing mail port. Prices vary, but most relay services cost between $15 and $30 per year. If you have a free Google Gmail account, your other option is to configure it so mail sent from it uses your regular From e-mail address. Then you can send e-mail from any Web browser. The $20 per year Yahoo Mail Plus also offers this option. Search Your Past Tired of a cluttered inbox, but loath to let go of old messages that might come in handy? 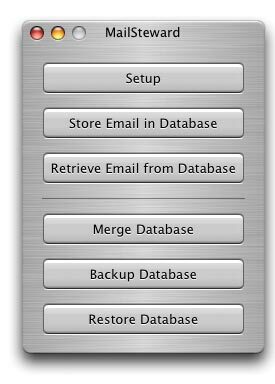 MailSteward makes it easy to archive and retrieve messages from Mail, Entourage, and most other e-mail programs. Better yet, you can do blazingly fast searches on one or more of your archived messages’ attributes. My inbox has more than 7,000 messages in it. This is making my e-mail program act strangely, but I hate to delete anything. Is there a good way to archive these messages so I can still search them? Too many messages in a single folder can often cause an e-mail program to act sluggishly. One way to remedy this is to try an e-mail archiving program (see “Search Your Past”), which work with most Mac mail programs, including Apple’s Mail, Microsoft Entourage (part of Microsoft Office 2004, $499), and any other program that can export standard .mbox files. These programs allow you to take older mes-sages out of your main e-mail program, but still quickly search the archives when you need access to your old mail. Check out Pubblog’s MailSteward 3.8 ($30), Moth Software’s Mail Archiver X ($35), and ManyBases’ FastMailBase ($97). You can download demo versions of all these programs to see which works best for you. If you’re feeling frugal, check out “The Miser’s Archive” for another archiving idea. When I include a large attachment with an e-mail message, I always make sure the attachment is small enough to fit through the e-mail gateway of my recipient. But when I try to send it, the attachment becomes so large that the recipient’s ISP rejects it. Why does the attachment get bigger? Attachments expand because your e-mail program encodes them in a text-only format for sending over the Internet. Examples of these formats are MIME and AppleDouble. Normally, recipients’ e-mail programs automatically decode files back into the original format, but if the messages are too big, some ISPs might refuse to accept them. One solution (other than sending smaller files) is to compress the file before you attach it to your e-mail message. Just select the file in the Finder and then choose File: Create Archive Of file name. The Finder will create a ZIP archive, which will almost always be considerably smaller than the original file. Send the ZIP archive. But check the archive file’s size; if it’s close to the maximum size the mail gateway will accept, it may bounce (because the archive file will grow in size when it’s MIME encoded). In that event, you should try to break the file into smaller pieces, or use another way to deliver the file, such as putting it on a shared iDisk for the person to download. I get a lot of e-mail messages from companies claiming to be PayPal or my bank and requesting my personal information. How can I tell which ones are legitimate and which aren’t? It’s best to assume that none of those e-mail messages are legitimate, and are instead the work of phishers —scam artists who specialize in sending messages that look genuine but that really take you to a Web site masquerading as your bank or another service. Their purpose is to fool you into entering user names, passwords, Social Security numbers, and financial information. The scammers can then log into your real financial accounts and clean them out. Legitimate companies never ask for personal or financial information via e-mail. At the most, they might ask, for instance, that you log on to the company site to update an expiring credit card, but they won’t include a link to the site in the e-mail message. Here are a few things you can do to make yourself a difficult target for phishers: be wary of any e-mail message that asks you to update your user information; it’s probably bogus. Phishing messages often have spelling errors, or tell you that you must update your account immediately or the company will close it.
. The address inside the angle brackets reveals that the source isn’t Amazon at all. Finally, legitimate e-mail messages from companies such as PayPal will address you by your user name. If the message says something like “Dear valued PayPal member,” it’s a fake.